Are dolphin sightings common in the Chesapeake Bay? Yes. Every summer, Maryland’s Fish and Wildlife Health Program receives reports of bottlenose dolphins (Tursiops truncatus) in the bay and its tributaries. They are typically seen from May-October in groups called pods, which often consist of both adults and calves and can include more than 50 animals. Dolphins migrate into the area following food sources when water temperatures are at their warmest. While they are typically observed hunting schools of fish, dolphins are intelligent animals and have been known to follow commercial watermen! How long are they found in the area? Dolphins stick around as long as food sources are abundant and water temperatures remain warm. Sightings have been reported as far north as Kent County. Occasionally, they appear in the Severn River, as well as around Kent Island. Sightings north of the Bay Bridge do occur, but are far less common than those occurring farther south in Calvert, Dorchester, Somerset, St. Mary’s and Talbot counties. Sightings are the most common along the Atlantic Coast at Ocean City and Assateague Island National Seashore. Do other marine species migrate here? Yes. To date, 23 migrating species have been found in Maryland waters, which tend to vary seasonally. In the warmer months, bottlenose dolphins, sea turtles and whales are most common. However, a few West Indian manatee sightings are also reported in the bay every summer. Sea turtles and whales remain in the area during the fall, and there is a shift to other species of dolphins. Once they’ve moved on, cooler temperate species such as harbor porpoises and seals arrive for the winter and tend to stay until spring. Rare species such as True’s beaked whales and spotted dolphins are also seen along the shore. Did I see a dolphin or a porpoise? Who do I contact if I think something is wrong? 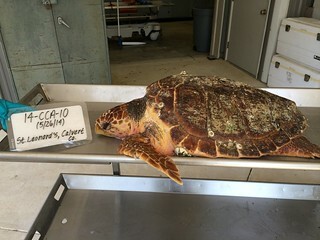 To report an injured, entangled or dead marine mammal or sea turtle, or to report suspected illegal activity, please contact the Maryland Natural Resources Police Call Center, available toll-free 24 hours a day, seven days a week at 800-628-9944. Is someone keeping track of these species? Yes. 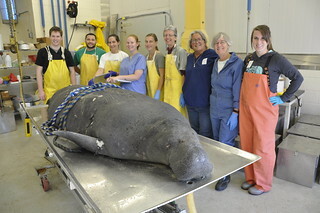 The Maryland Fisheries Service Marine Mammal and Sea Turtle Stranding Response Program—established in the fall of 1990—responds to all dead strandings that occur in the Chesapeake Bay and along the Atlantic Coast, which includes approximately 3,800 miles of coastline. Since the program’s inception, personnel have responded to more than 450 marine mammals and 600 sea turtles. Program staff works cooperatively with the National Aquarium in Baltimore, which responds to live strandings. Reporting sightings benefits both programs, as it provides a greater understanding of both the number and variety of species frequenting Maryland waters. The Stranding Program also partners with the Smithsonian Institution to examine endangered and rare species, and the carcasses and skeletal specimens are eventually accessioned into their collections. What should I do after an encounter? Enjoy the experience! You are welcome to take photos or even a video to document your encounter. However, remember that the Marine Mammal Protection Act prohibits the harassment of any marine mammal species. Harassment includes, but is not limited to, chasing or following an animal and/or getting too close, touching an animal, and attempting to swim with or feed them. This is as much for their safety as it is for your own. Additionally, maintain discretion when encountering sea turtles. All species are threatened or endangered and protected under the Endangered Species Act. Fines up to $25,000 and up to a year in jail can be imposed if illegal activity is determined. Fact sheets on the seven most common marine mammal and sea turtle species found in Maryland waters. For additional information, visit the Maryland Department of Natural Resources Stranding Response Program website. For questions, comments or concerns, please contact Marine Mammal and Sea Turtle Stranding Coordinator Amanda Weschler or Fish and Wildlife Health Program Leader Dr. Cindy Driscoll.